As it becomes closer to winter I always want something that’ll warm me up. I’m more likely to make a spicy food, soups, or stews. In Japan there’s hot pots as well which is great when you’re with a family! 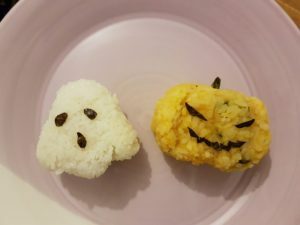 As it was recently Halloween, and it is most definitely getting cold, I’ll be talking about a household staple in Japan: kabocha’s nimono. 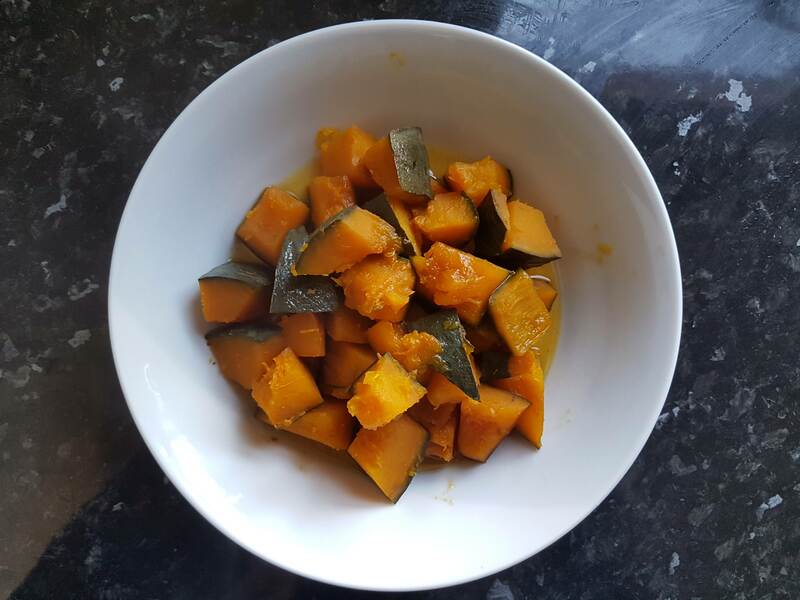 Kabocha is a Japanese pumpkin which is very different from the UK pumpkin as it’s texture is more like a potato, and it is much sweeter. 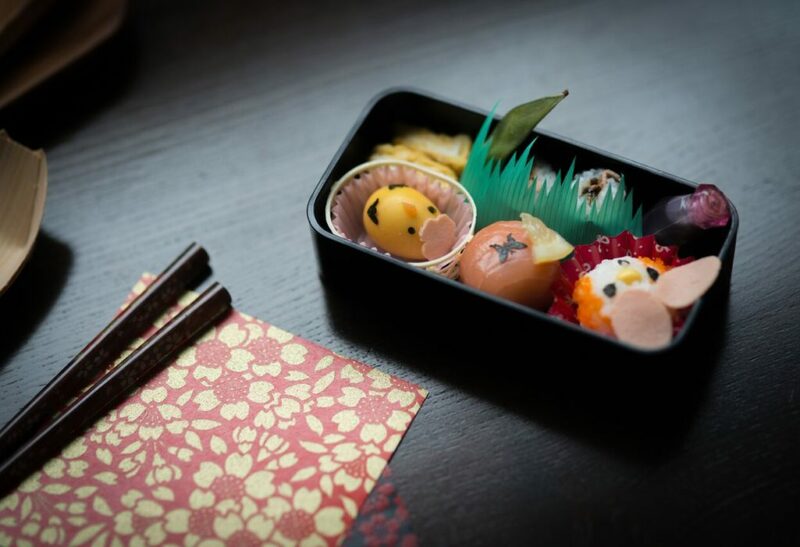 A lot of ingredients in Japan are actually quite sweet with a more earthy type taste, another example being the sweet potato. 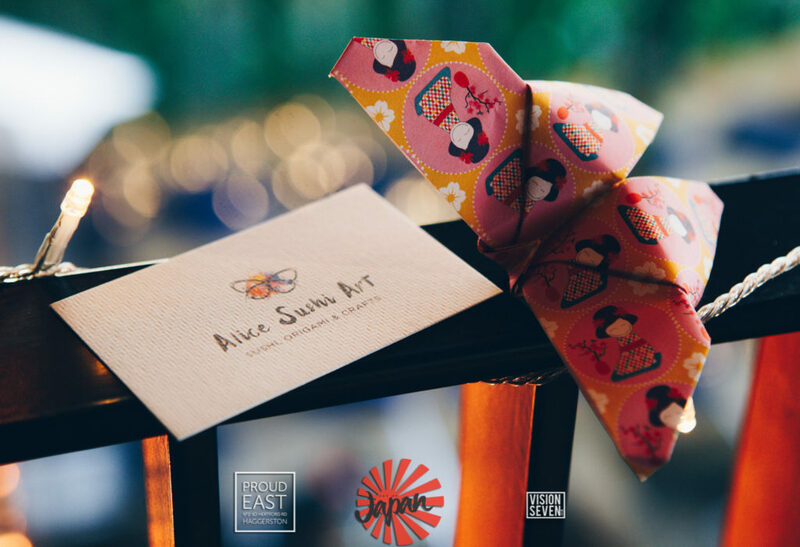 I’ll post a tempura recipe using that at some point as it’s one of my favourites! 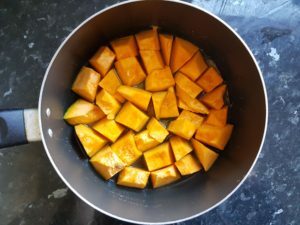 Nimono means stew, so this recipe is strewed Kabocha. You can add additional ingredients to this recipe, but it’s common enough for the kabocha to take centre stage alone. 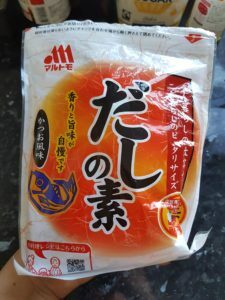 This can be both a main dish to eat with some rice, salad, and miso soup, or if you don’t have very much of it it can easily be eaten as a side dish such as the Ohitashi (pickled vegetables in soy sauce). Mirin is a sweeter version of cooking rice wine, less drier (I find anyway) than sake. This should be available in most Asian super markets by now. 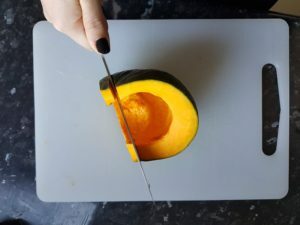 A few key pointers with cutting the kabocha as it’s very tough, and if not cut right can be dangerous so please be VERY careful when cutting into it! – Don’t use brute force and cut downwards. I always end up trying via habit but it doesn’t work! 1. 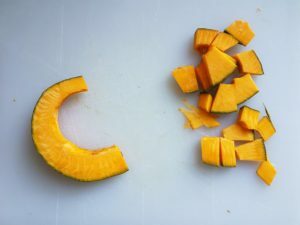 Cut the kabocha into bite-size pieces using the pointers above. 2. Put the cut kabocha, water, and powdered Dashi stock into a pot. 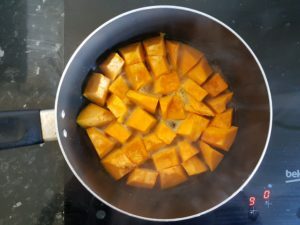 A key point here is to ensure the kabocha skin is facing DOWN as this means the skin is cooked through first, ensuring it’s nice and soft, and it also stops the inside of the kabocha crumbling into the stew when cooking. 3. Cook the kabocha under high heat until boiling. 4. 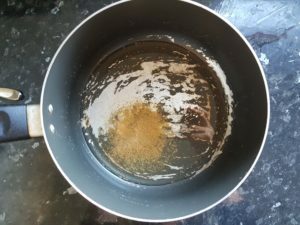 Once boiled, lower the heat to slightly under medium heat, and add the Mirin, soy sauce, and sugar. 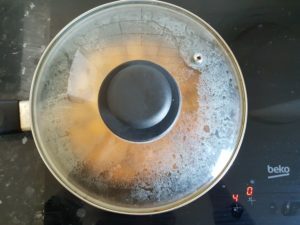 You want the liquid to be simmering so keep an eye on the temperature of the heat- be careful not to burn anything! 5. Boil for 20 minutes with the lid on. 6. Take lid of and ensure kabocha skin is soft by poking a chopstick through it. 7. Dish up and serve! Once you have the ingredients, quite simple right? 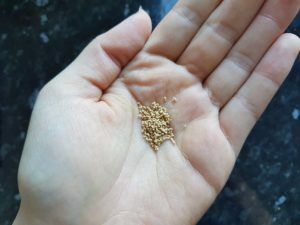 You can eat this for about 4 days and it’s nice both cold and hot! I love having it with freshly cooked rice as the flavour of the broth tastes perfect when mixed in. 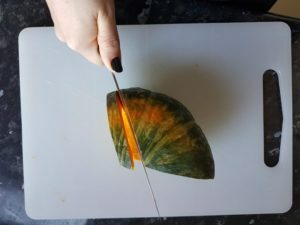 You can also freeze kabocha if you end up with a lot left over – just boil it (some people like to microwave smaller bits in Tupperware with water) and then put it in a bag and freeze once cold. 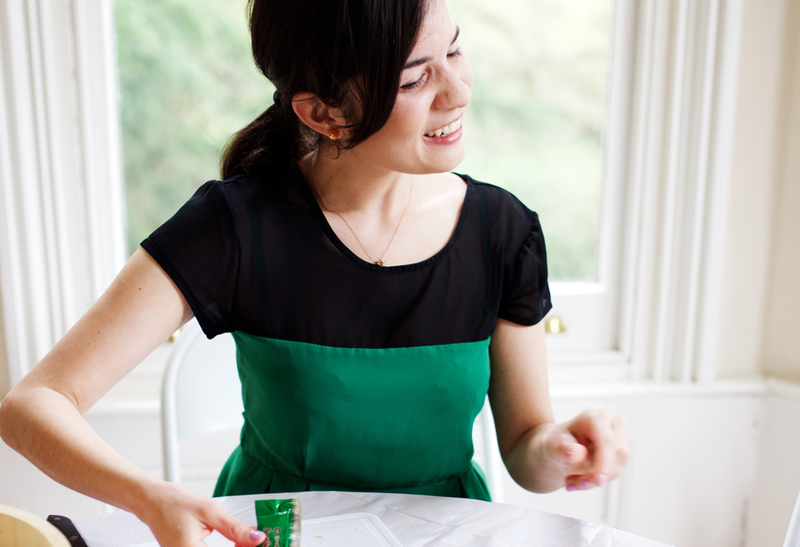 Then you can use it whenever you want in lots of other cooking!